The Ute trail is located in the Garden of the Gods Park in Colorado Springs, Colorado. The trail begins at the South Garden Parking Lot 10. From there it makes a loop that takes it through a lush green valley that lies between the South Garden area and a long ridge that runs parallel to it. 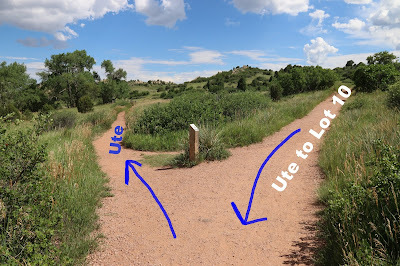 As the trail loops around it is connected to by the Chambers, Valley Reservoir, Niobrara, Ute Trail Connection and once again by the Niobrara trail before arriving back at the parking area where it began. The trail begins out of the north end of the parking area where there is a kiosk that provides some very interesting information about the history of the area dating back thousands of years. After passing a granite monument to the 'Indian Trail' that was erected by the local chapter of DAR (Daughters of the American Revolution) the route continues by paralleling the loop road. A long series of terraced steps ease the trail into the valley below. Cathedral Rock stands in grand repose as the trail passes in review. Once in the floor of the valley the trail forks with the loop continuing to the right while a spur continues straight ahead that leads on to the Gateway Road. As the spur reaches the Gateway Road the Chambers trail joins in on the right. 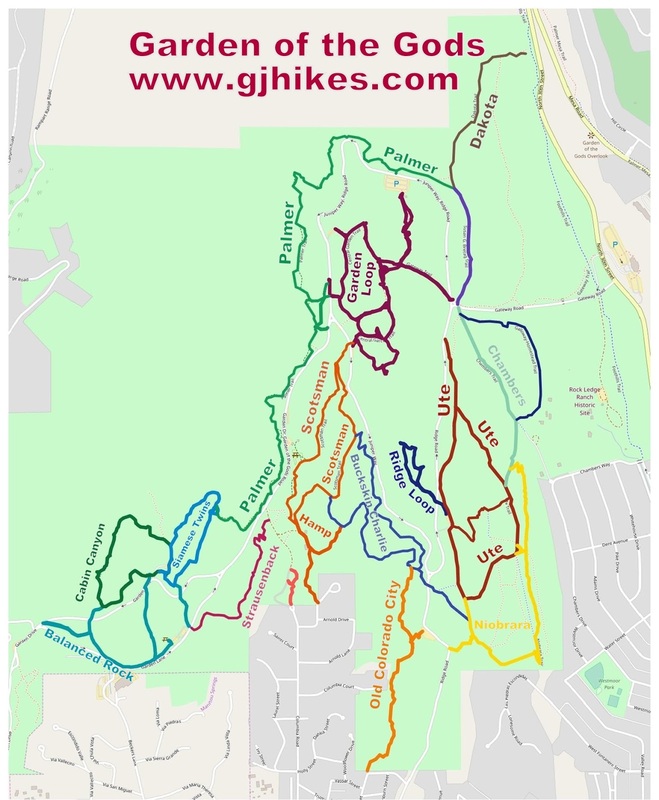 The Chambers trail can be combined with the Valley Reservoir trail to create a slightly longer route for the loop. Back at the first branch that we came to the Ute trail heads down the middle of the valley. 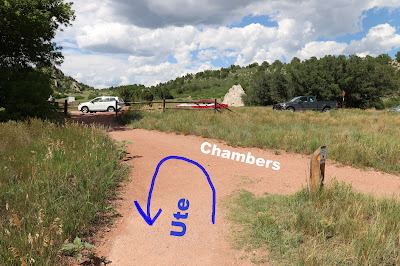 As the trail travels through the valley it is joined on the left by the Valley Reservoir trail then on the right by the Ute Trail Connection that provides a shortcut back to the parking area. Looking back over your shoulder shows just how pretty the trail would also be if traveling in the opposite direction. As the trail begins turning toward the west it is met by a spur that leads up to the Niobrara trail on the ridge above. Pikes Peak (14,115 feet) begins looming ahead on the distant horizon. The Ute trail is met once again by the Niobrara trail as it turns back toward the trailhead. After a gentle climb out of the valley the trail reenters the parking area at the south end. Our round trip distance of 1.6 miles included hiking out and back on the spur that led to the Gateway Road. 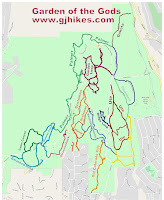 There are a lot of options for combining different trails to come up with whatever type of outing you are looking for. The options are greater for hikers and horseback riders than they are for mountain bikers but there are enough trails for everyone to enjoy the Garden of the Gods. If you would like to see it for yourself then all you have to do is 'Take a hike'.